Minneapolis, Minn. – The Lynx were back on the prowl Saturday night, crushing the Dallas Wings, 93-56. 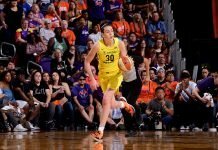 Minnesota was without starting guard Seimone Augustus for the second consecutive game, with knee soreness, and Dallas was was missing two of their first five with injuries. But the hosts, who lost to the Sun in overtime two days ago, snapped back to dominate the visitors. Four minutes into the opening period, a Courtney Paris layup gave the Wings a three-point advantage. It wound up being the final time they had control for the remainder of the contest, as Minnesota took the lead shortly thereafter and never looked back. They stretched the margin to as many as 46 points in the final quarter. Lindsay Whalen lead five Lynx players in double figures with 22 points. Before the game, Whalen emphasized the need for her team to be aggressive. It was a total team effort for the Lynx, as eight of 10 active players scored. Wings point guard Erin Phillips, who netted nine points, said playing at a packed Target Center was a challenge. The 16-4 Lynx will now travel to San Antonio to take on the Stars. They previously defeated San Antonio 91-68 July 2 at Target Center.